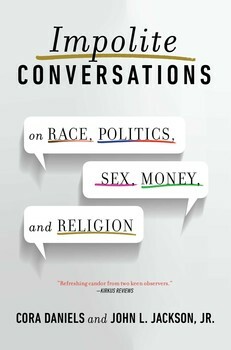 Impolite Conversations is a fascinating collection of essay that captures a set of exchanges between journalist Cora Daniels and cultural anthropologist John L. Jackson, Jr. I make an appearance in Jackson’s chapter titled “All my best friends are light skinned women.” You’ll have to read the book to see how I fare. But check out my brief exchange with John about how I think about the question of skin color today here. This episode is part of their Impolite Conversations Web Series. View the interview here. Download the interview here. This entry was posted	on Sunday, December 14th, 2014 at 23:25Z	and is filed under Anthropology, Identity Development/Psychology, Interviews, Media Archive, United States, Videos. You can follow any responses to this entry through the RSS 2.0 feed. Both comments and pings are currently closed.